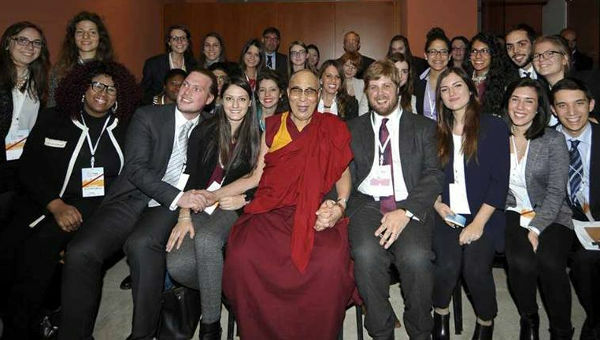 A delegation of forty JCU students took part in the 14th World Summit of Nobel Peace Prize Laureates Summit which was held in Rome the second weekend of December. The event took place at the Auditorium Parco Della Musica on Friday and Saturday where students attended sessions with the Nobel Laureates in the morning, while the afternoon was dedicated to an interactive workshop covering a variety of issues ranging from social business to nuclear disarmament. On Sunday, the Summit was held at the Campidoglio, Rome’s town hall, where the students attended a press conference with Nobel Laureates His Holiness the Dalai Lama, Jody Williams, Shirin Ebadi, Tawakkol Karman, Betty Williams, and Leymah Gbowee, to whom they addressed questions. Afterwards, the students submitted their projects to the “Mazda Make Things Better Competition,” which awards 10,000 Euros to the student who proposes the most innovative tools of advocacy. During the summit, eleven JCU student delegates had the unique opportunity to participate in the “Mazda Make Things Better Competition,” which awards 10,000 euros to the student who proposes the most innovative tools of advocacy. The students had been preparing for this presentation with Prof. Argentieri of the Guarini Institute for Public Affairs prior to the event, following an invitation from LUISS University professor Enzo Le Fevre Cervini. Neal Huddon-Cossar, International Affairs and Economics senior from the U.S., explained that he will never forget when Iranian Laureate Shirin Ebadi stood up and embraced Laureate Tawakkol Karman from Yemen, apologizing for the Iranian government’s interference in the Yemeni revolution. Neal thought that it was a powerful symbolic gesture of their solidarity against the public dictatorship of the Middle East. Neal’s take away from the summit is that civil society possesses the ultimate power, not governments or businesses. Hence, each of us can change this world for the better. Giacomo Sproccati, Communications senior from Italy, appreciated having a chance to take part in the summit because “hearing about other people’s experiences encourages you to pursue your dreams.” Specifically, Giacomo was impressed by Nobel Laureate Mairead Maguire’s positive approach and her sweet tone of voice which managed to inspire every person who listened to her. Moreover, Giacomo valued the Dalai Lama’s encouragement to look at events from a wider perspective, because in that way you can find the positive side which helps solve problems. For Valeria Borghetti, International Business senior from Italy, the summit was an opportunity for an international gathering of commitment, dedication, and true passion for the achievement of peace. Interacting with the Dalai Lama and participating in the press conference with all of the Laureates was a once-in-a-lifetime chance. “Three days filled with inspiration and enlightenment! I could not have asked for a better way to end my academic career at John Cabot University,” said Valeria. The student delegates wish to thank the Permanent Secretariat of the World Summit of Nobel Peace Laureates and in particular, Livia Malcangio and Viktoria Devdariani for what was described by Asia Colombo, Communications senior, as “the opportunity of a lifetime”. For more photos, check out our Facebook album 14th World Summit of World Peace Laureates.